Prometheos S. r. l., whose foundation was promoted by Carlo Beccarini, soon followed by his sons Luca and Dario, stands as the result of over half a century of passion and experience in Art and Rare Book collecting shared by the members of the Beccarini family. A taste for books and Beauty was given Carlo by his parents who surrounded him with prints and works of art. He began collecting paintings, furniture and volumes in his early years, giving special attention to Italian Baroque paintings, ancient bookbindings (especially the Roman ones dating from the 16th to the 18th century), volumes on economics, cookery and historical photography. 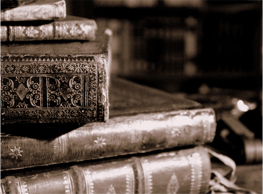 Being not just an antiquarian bookshop, but also a company focused on Cultural heritage and events, Prometheos deals with the creation and organization of exhibitions and museums, taking part in the publication of scientific and popular texts and playing an active role in spreading the knowledge of cultural patrimonies.